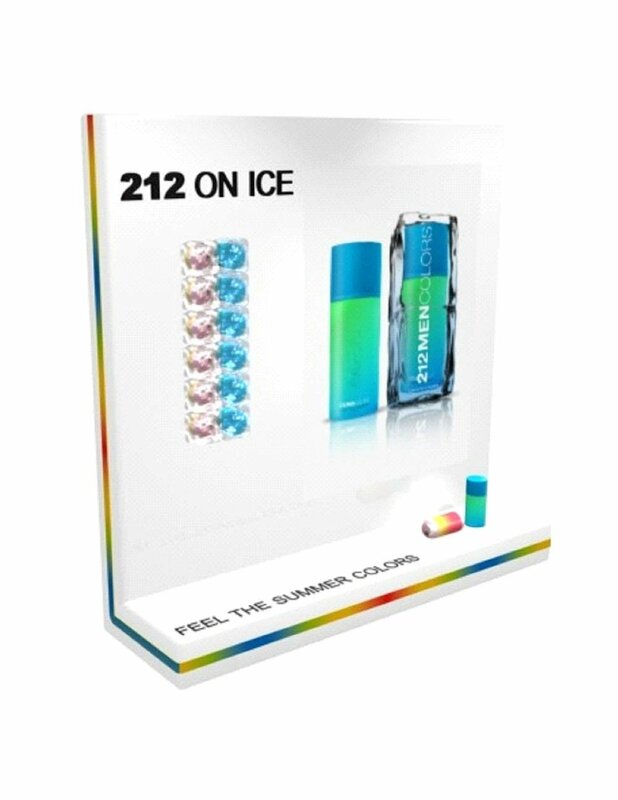 In this summery version of the 212 fragrance by Carolina Herrera, the characterstic cylinder appears wrapped between two ice cubes. Following the leitmotiv of On Ice, vilablanch proposes a display that is shaped like a block of ice, which contains the product and evokes the function of an ice tray. The color strip that is printed on the sides includes both the warm and the cool colors of the feminine and masculine fragrance bottles, while the yellow acts as a transition between the two. 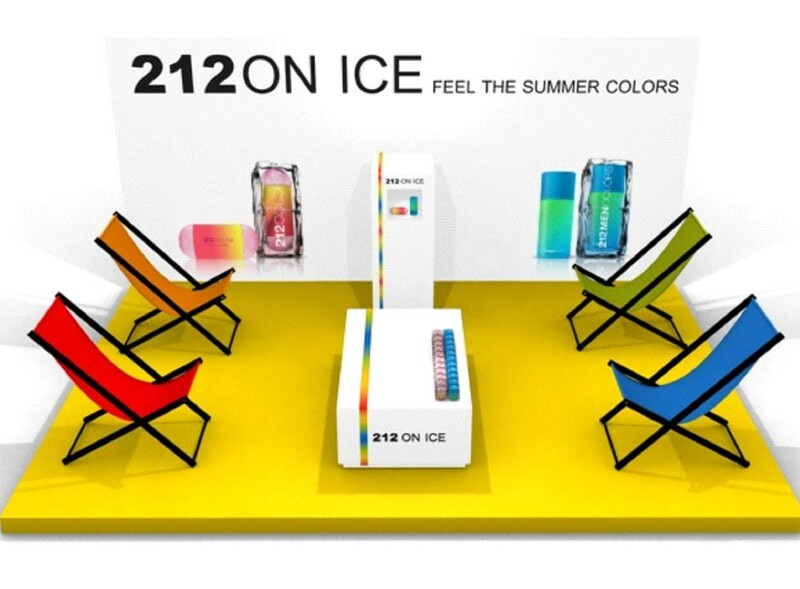 The Puig group was launching a new summer edition of the 212 Carolina Herrera fragrance. Summer fragrances are always characterized by their freshness, lightness and playful or informal character. 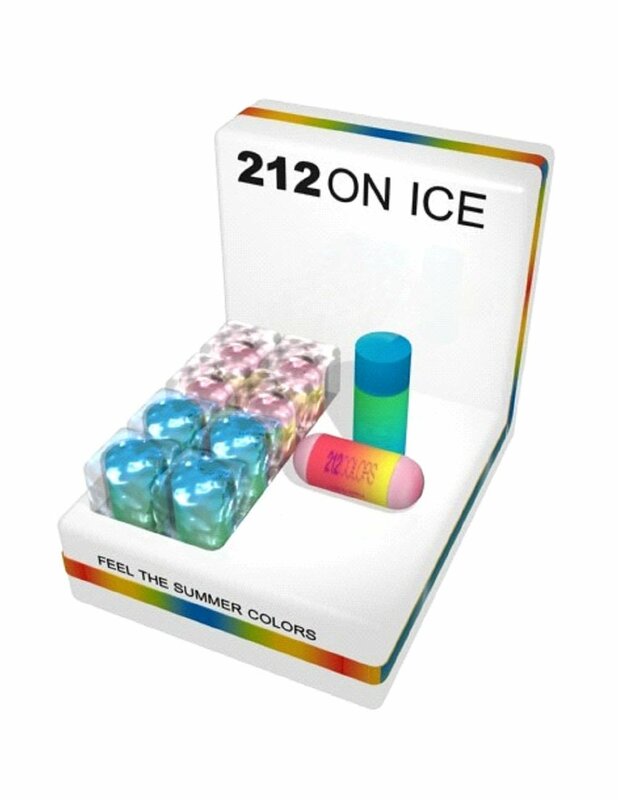 The leitmotiv chosen for the packaging of On Ice is the colosr and the starting point is a bottle with high visual impact. After testing several concepts, vilablanch concluded that the product, far from "asking" for a system that added complexity or weight, "demanded" a treatment that would leave all the protagonism. Our goal was to bring the view to the bottle at the point of sale. Our inspiration: the color. The feminine fragrance, with a presentation in which the red predominates, offers a warm look. The masculine, on the other hand, of green and blue colors, cold, offers a fresh image. The challenge is to achieve the unity of the bottles in some exhibiting elements that highlight three concepts: Color, Summer, and Freshness. The union of red-orange (warm range) and green-blue (cold range) is made by transit through yellow. Yellow is the color of summer, as it symbolizes the light of the sun. The visual linkage of male and female fragrances is achieved by a continuous line of color, predominantly yellow, printed on the side of the exhibitor. The inspiration for the design of the exhibitor is a classic object: the cubitera. We propose a white display, of important width, that remembers to a block of ice with rounded corners. The fragrance is embedded in the interior, as if cooled.